A syndicate which used bogus jobs to trick the authorities into approving work permits for Chinese nationals has been smashed. The Ministry of Manpower (MOM) arrested 44 people in an islandwide operation over two days last week. They include the syndicate's suspected mastermind, a Chinese national in his 30s, who was nabbed in his Ubi office. He was among six alleged members of the syndicate who were arrested, along with 38 workers from China who were picked up at dormitories or construction sites. MOM is still investigating the total number of workers the syndicate brought in to work illegally. In the last five years, MOM has taken enforcement action against an average of 20 employers each year for such illegal importation of labour. MOM shed light on how such syndicates operate. They typically set up shell companies, which have no real business operations. "Fall guys", with no actual knowledge of what the company does, are hired as directors. 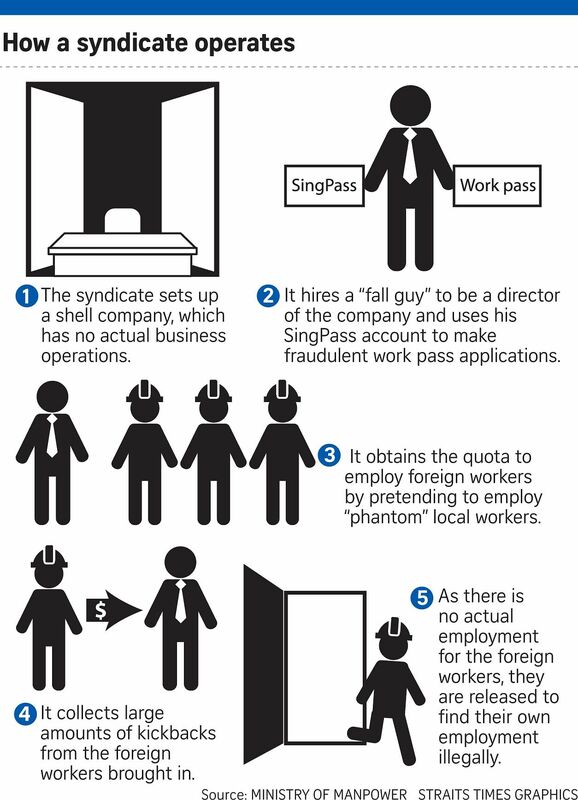 Their SingPass accounts are used to make fraudulent work pass applications. The shell companies then obtain the quota to employ foreigners by pretending to hire "phantom" local workers. The syndicates also collect large amounts of kickbacks from the foreign workers brought in. Many workers, said MOM, willingly pay for the chance to get a work pass to stay in Singapore, and thus conspire with the syndicates. Advocacy groups say they have seen workers fork out amounts that exceed $14,000. They are then released to find their own employment via illegal means. Foreigners who work without valid passes face a fine of up to $20,000 or up to two years in jail or both, unless MOM determines they were victims. Ms Debbie Fordyce, executive committee member of foreign worker advocacy group Transient Workers Count Too, said some workers are willing to pay high kickbacks and risk stiff penalties as they could get paid two or three times more if they find their own work. "Where they come from, there is such desperation. People would put their lives at risk if they could just get that bit of money to send home," she said. Employers who hire foreign workers seeking illegal employment face a fine of between $5,000 and $30,000, and/or up to a year's jail. Main contractors with illegal workers at their worksites are liable to be fined up to $15,000 and/or jailed up to a year. They will also be barred from hiring foreign workers. Singapore Contractors Association president Kenneth Loo said some construction firms, which are short of labour or need to complete a project quickly, might be tempted to take on illegal workers. "But that's no excuse," he said. "It's just like stealing, it's a crime. The penalty is very strict and I think the industry knows this. It doesn't pay in the end."